Hello! (if there are any other readers left out there). I am resurrecting the blog to update you on my sponsored rides that I am doing in 2013 (and hopefully persuade a few of you to sponsor me!). Since my last update in 2011 I've cycled very nearly 10,000 miles on my new bike (although really not very new anymore) and have lost over 50 lbs so am now slightly less of a Big Bloke on a Bike! 2012 was a difficult year for my wife and I as my father in law died very unexpectedly in February at the age of 60. He had a heart condition which we did know about but had no idea how serious it was. 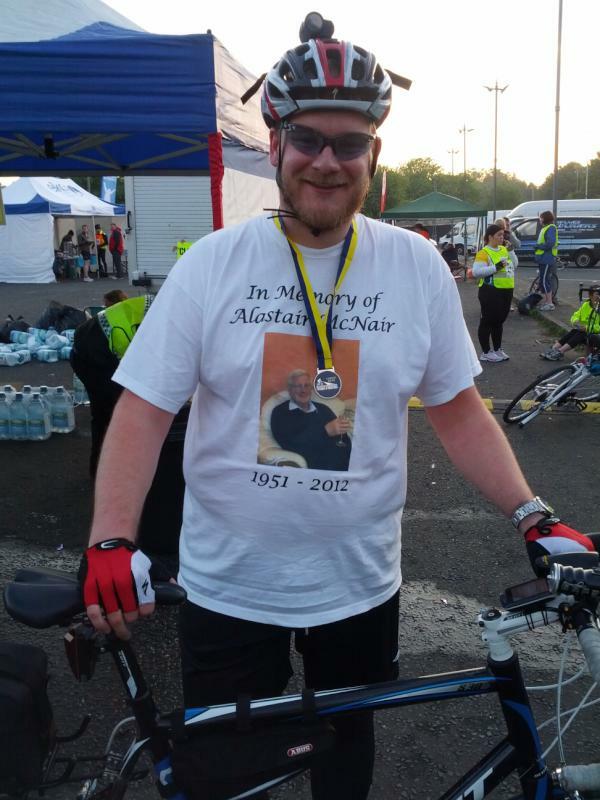 In 2012 I cycled in support of the British Heart Foundation in memory of Alastair and I will be doing so again in 2013. Last year I managed to raise a massive £1697 thanks to many friend's and families generosity. Alastair's death was a huge shock to all of us and obviously caused a lot of upheaval in the McNair family. He was a wonderful man and we all miss him very much. I hope that by supporting the BHF I can help to prevent this happening to another family. This year I am upping the bar a little and will be doing 4 events totaling 277 miles! Nightrider Paris 21st September - 100 KM (62 miles) round Paris starting at around midnight This is quite a step up from the 2 events that I did last year. 100 miles in one ride is a long way so I need to prepare for this. The first two rides should be fairly easy without any preparation and they will be good preparation for the long ride in themselves. I am also doing King of the Downs the week before Nightrider. That's a 115 mile or 50 mile ride over 10 big hills around the Epsom Downs. I'll be doing the shortened 50 mile, 5 hill ride and then hopefully recover in time for Nightrider the following week. Between London to Brighton (which is the week after Nightrider) and the London 100 I've got nearly 2 months. I've got a couple of free weekends then so I'm planning on doing a 75 mile or so to get ready for the big 100. So far I've not really done any specific training. I've had 3 weeks back on the bike after being ill for a few weeks. In those 3 weeks I've done over 500 miles which is some pretty good training, particularly as I had some very strong head winds. Anyway, I think that'll do for now. I'll try to post updates with how I am doing in my preparations for the big ride.